Former Smiths lead singer Morrissey has announced a concert date in San Jose following a scuffle last year where he was tackled to the ground while on stage. 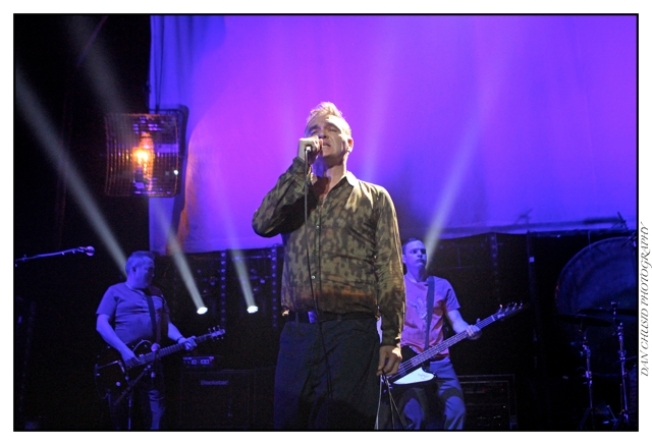 Morrissey was singing "Someday Goodbye Will Be Farewell" on stage at the City National Civic in San Jose on May 7, 2014 when he was tackled to the ground by one or two overly exuberant fans. The 20-song set was cut short just moments before the likely organic ending of the show when the singer was ushered offstage by his security team after a flurry of fans risked their safety to run onstage and touch him. Though his lyrics often speak of impossible loneliness, he has always been lavished with intense affection by fans at concerts. "Maybe he needs more security, but that's part of the Morrissey experience," said fan James Fleishman of Santa Clara, who took a minute-long video of the incident. "People have been storming his stage for 30 years." The singer was again knocked to the ground just 10 days later at a concert performance in Denver. Tickets are on sale now for a July 25 engagement at Event Center at San Jose State University.